Villa Kisla Tas is a beautiful, modern and stylish 4 bedroom villa in Kalkan in a lovely location by the sea. Villa Kisla Tas is a beautiful, modern and stylish 4 bedroom villa in Kalkan in a lovely location by the sea. It has amazing panoramic sea views and together with its beautiful large swimming pool you will never want to leave! On the ground floor is the gorgeous living area complete with a fully fitted kitchen, dining area and living area with a tv, dvd player and stereo system. The French doors open to the outside dining area and barbeque and lovely huge pool terrace area where you can relax and dine with a spectacular view of the turquoise bay. The villa has a total of five bathrooms and four lovely modern bedrooms all with their own en-suite luxury bathrooms with lovely big balconies comfortably sleeping eight people. Perfect for families big and small or for group holidays with friends. Because all the bedrooms are quite large they will take an extra bed or babies cot no problem. Being just a five minute walk from the beach and beach club, it is a perfect location for those wishing not to drive especially with its own wonderful pool you are never far from a refreshing swim, with an outdoor shower to rinse off. There is a local small shop near the villa for your daily groceries. The Villa is a 5 minute drive and a 20 minute walk from the Kalkan town centre. Villa Kisla Tas has amazing panoramic sea views and together with its beautiful large swimming pool you will never want to leave! The pool is surrounded by a spacious patio area, equipped with sun-loungers and plenty of sun-shades. 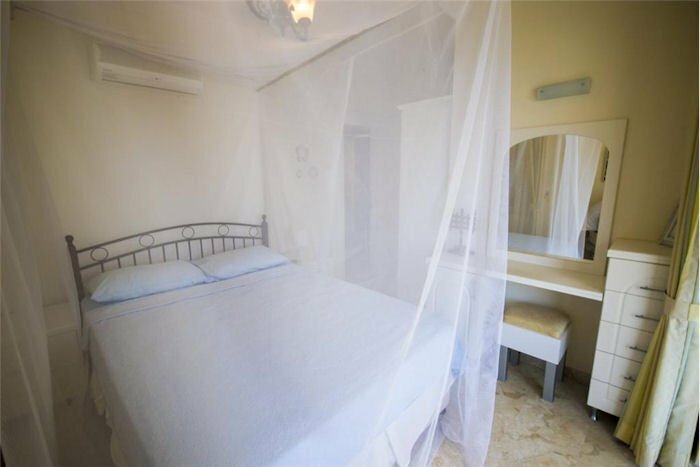 It's beautifully decorated and furnished throughout and extremely well equipped, to ensure that you can relax and enjoy your time in Kalkan in comfort!